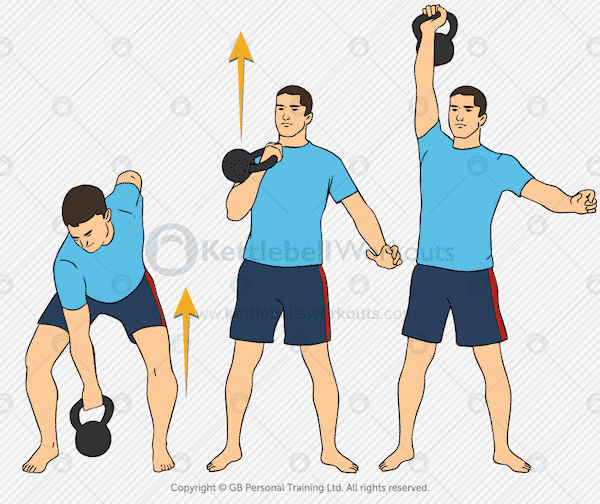 The Kettlebell Clean and Press combines 2 exercises the Kettlebell Clean and the Overhead Press. Combining these 2 kettlebell exercises into one fluid movement will work over 600 muscles in the body as well as putting large demands on your cardiovascular system. The two individual kettlebell exercises should be practiced first before being performed as one complete movement. The kettlebell clean and press can also be performed with 2 kettlebells to add some real overload to the body. Once the kettlebell has been cleaned up to the racked position there should be a moments pause before pressing the kettlebell overhead. Failure to pause between the two movements can result in incorrect breathing patterns and a lack of concentration during the top part of the exercise. As you start to lift heavier kettlebells you will appreciate this moments pause for composure. I can barely hold the kettlebell in the rack position for more than a few seconds, because the kettlebell pressing against the back of my forearm hurts like hell. Is this just because I’m a beginner and this area will become less sensitive over time or am I doing something wrong? I’ve got a 26 lb and 40 lb KB here at my desk. The 40 pounder is a lot more comfortable to rack because, like Greg said, the space between the handle isn’t long enough on the smaller one, meaning that the weight is resting high on my wrist rather than on the more muscley part lower down. Another thing to try is gripping the handle harder, which may protect your forearm by hardening the muscles. Hi Ralph, the Dead Clean from the floor, like the standard deadlift, starts from a “Dead” position and will develop strong explosive hips. The Swing Clean utilises more momentum as the bell is swung between the legs so less explosion is required. The Swing Clean can also be harder for people to master because controlling the top of the clean can be tricky and bang the wrists – good timing is needed. I would therefore recommend that everyone start with the Dead Clean before progressing to the Swing Clean. Ive just started getting interested in a few more kettlebell exercises. I usually just do the two hand kettlebell swing at the end of my run. After searching through many beginner guides to kettlebells, I can honestly say your site shows the exercises clearly, quickly but with lots of useful easy to understand info. You dont waste a lot of time talking about random irrelevant stuff. I am more confident to try clean and press and one hand kettlebell swing. One question though, when you do clean and press, should I do 25 reps straight in a row on one arm or alternate arms up to 25 reps. I think my arm would be so tired doing 25 in one set! Thanks Emma, I’d keep your Clean & Press routine simple. Start with 1 on each side, then 2 on each side, then 3 etc. see if you can get to 5 then start coming back down…4, 3, 2, 1. Once you are comfortable with this, maybe in 4-6 weeks time you can work on higher rep numbers. I love your videos. They arent too long and you put lots of useful info in them. I feel a lot more confident doing the clean and press now. Loved your quick, yet thorough presentation. Great body demonstration, clear example.